The new multirole all-weather superagile fighter Su-37 (registration number 711) with full thrust vector control (TVC) represents a logical step forward in the steady implementation by the Sukhoi EDB of a development program of fourth and fifth generation of tactical aircraft from the basic Su-27 fighter for the Russian Air Force. As announced by General Designer Mikhail Simonov, the new fighter is related to "the fourth with two pluses" generation. 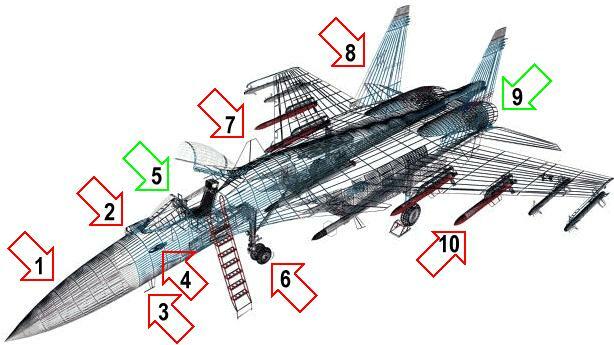 This is the latest, although far from the last, Sukhoi's development. automation of all phases of flight and combat employment. The Su-37's powerplant comprises two experimental TVC turbofans, type AL-31FU. The engine was developed by the Lulka-Saturn company team, led by General Designer Victor Chepkin, and is a derivative of the twin-shaft AL-31F turbofan installed on the Su-27. It has a modular design, which allows for replacement of its nozzle, afterburner, mixer, low-pressure (LP) turbine and compressor, and gearbox as part of its post-warranty servicing. One can also repair or replace the blades of the first stage of the LP compressor and all stages of the HP compressor. The axis-symmetric swivelling nozzle is secured to the annular swivel and can be moved in the pitch plane with the aid of two pairs of hydraulic jacks. Depending on a maneuver to be performed, the nozzles can be deflected both synchronously and differentially. The biggest problem with the implementation of the TVC nozzle concept, that has still not be resolved by the Americans, was to provide the nozzle reversal joint with a seal strong enough to prevent outblast of the gases with a temperature of almost 2,000 oC and pressure of 5 to 7 kgf/cm2. The AL-31F and AL-31FU engines are fully interchangeable; in other words, all the derivatives of the Su-27 and the base aircraft may be powered by the AL-31FU engine. As well as powering the Su-37 fighter, the AL-31FU engine will be first installed on the Su-30MK multirole two-seater fighter. The Su-37 uses the 'unstable integral triplane' layout, which, in combination with the small specific load acting on the wing, high power-to-weight ratio, integral electrical remote control system and powerplant TVC feature, ensures the aircraft superagility, increased range of controlled flight and improved takeoff and landing characteristics. The TVC feature incorporated into the aircraft flight control loop makes it possible to minimize, when required, the flight speed and perform aerobatics at speeds nearing zero without angle-of-attack limitations (hence superagility). According to Mikhail Simonov, the aircraft has virtually no angle-of-attack limitations. It can fly flatwise to the air stream, with its tail forward, i. e., with 90 and even 180 deg angles of attack. It can locate targets with its radars and attack them with its weapons from any position. This feature is extremely important for both air combat and the evasion of enemy missile attacks. Su-37 is furnished with the full range of onboard systems and equipment, and is a prototype of the series production aircraft. Its avionics equipment comprises an onboard multifunction jamproof forward-looking phased-array radar that can track up to 15 targets at a time, provide target designation, launch and guide several air-to-air missiles fitted with active, passive and IR homing heads, and an optronic fire control and surveillance system. In addition, the onboard avionics equipment is used for mapping, multichannel employment of guided weapons and low altitude flight with avoidance of ground features. The information and control facilities in the pilot's cockpit cover four wide liquid-crystal displays of tactical and flight-navigation data, onboard system monitors and an operating conditions control panel. Information from individual systems may be presented on any display selected by the pilot. One more widescope indicator is installed on the windscreen. The side short-travel control stick of the aircraft, avionics control handle and strain-gauging engine thrust controls, as well as tactical situation, flight conditions and systems monitors enable the pilot to effectively control the aircraft, systems and weapons. 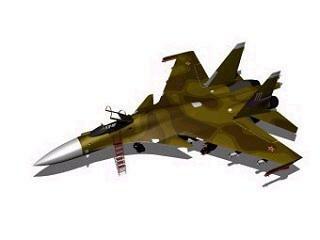 The Su-37 multifunction fighter can carry air-to-air and air-to-surface weapons at its 12 hardpoints. For air combat, the aircraft is fitted with R-73E short-range air-to-air IR homing missiles and RVV-AE air-to-air missiles with active radar guidance. To attack ground and water-surface targets, the Su-37 can carry IR and radar homing missiles. In the opinion of leading western experts, the Su-37 fighter will stay unrivaled for many years to come and take a deserving position on the world arms market. Pitot tubes moved from nose cone to the fuselage, this reduces radar clutters(2).